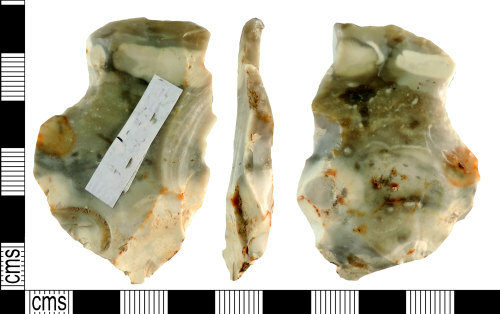 A complete knapped lithic implement of late Neolithic to early Bronze Age date, circa 2700 - 1600 BC. The implement is a notched scraper formed from a tertiary flake which is sub-ovate in plan and section. The ventral surface is mostly smooth displaying a bulb or percussion and bulbar scar from which ripples of percussion radiate. The dorsal surface is irregular with long flakes having been removed and a notch is present to the left mesial edge which displays short, abrupt, scaled retouch. The right-hand distal edge has been shaped into a point by spall removal perpendicular to the point and is likely to have functioned as an awl or piercer. The flint is a patchy grey to white colour with some iron staining on the surface. The implement is 53.9mm long, 36.2mm wide, 9.9mm thick and weighs 18.2g.